The 3 Pillars of Health Care & Rodrol "Nobel Dream"
Which leads to "Rodrol "Nobel Dream"
What do we mean by "Rodrol-TIME™ 2017" ? Close your eyes, and visualise what Rodrol-Time™ could mean for you? 1. Clean Living or FORBES' Life Style? In 2017, it will be the 50th year of my professional life, since my college education in Engineering Physics, at Laval University in 1967. Then, I completed the M.A.Sc. and Ph.D. degrees in Biomedical Engineering at the University of Toronto, in 1971. In 2015 and 2016, we produced the Rodrol ABC series of 27 video clips. Most of these clips are accessible from the links given below. 3. What can be called "Scientific Buddhism"
These 27 video clips were realized with the help of the following members of the RHUMART team: Denis Carrier working with us since 1980 ; my sun François and my daughter Josée-Anne who have also been involved in the success of the RHUMART approach, since its introduction in Canada, in 1980. The present document on "The 3 Pillars to Save 35 % on Health Costs" is intended to help all human beings who wish to engage in reducing the burden of health costs on society and all afflicted families. It is more specifically addressed to the following persons and organisations because we strongly believe that they can help realise our goal, which is to reduce by at least 35 % the overall health costs, worldwide. - the Editor of the New York Times J. Of course, our goal is realistic only in countries and communities where the political will, and other means, to achieve the said 35 % reduction, say, within 5, 10, or maybe 20 years, are effectively present. "Clean Living, FORBES' STYLE" and "Highlights of FORBES' article, Nov. 2004". About the "New England J. of Medicine", NEJM : When I was present at the "Harvard Business School " (at one Alumni Meeting of 2005). After the talks by the representatives of "Big Pharma" companies, the Chief Editor of the NEJM accused the last speaker of Pharma's representative to make medical doctors look like criminalsin the eyes of the public. This, he said, because Pharma's drugs often deteriorate the condition of too many people instead of really helping them. "As you know, doctor, we are all in this together"
This indicates that Big Pharma companies behave as if they consider medical doctors, and their activities, as part of their own business team and activities? About the New York Times and the FDA representatives present at the above mentioned Harvard meeting, they witnessed the above conversation and, the woman representing the FDAaffirmed loud and clear that all drugs have damaging side effects, especially when not properly prescribed or used. However, in 2015, we were made aware that the said FDA created a new category of devices called"
which are considered safe, causing no harm to responsible users. based on the use of such "Wellness Devices". About the ICIM and Medication Reduction Therapies (MRTs), I have personally appreciated the important efforts made by the members of the ICIM, during their 62nd meeting in Toronto (Sept. 9-11, 2016). The speakers at this meeting proposed many alternatives to non-essential drugs that cause more harm to patients than the real benefits they offer. (For info on ICIM, see <http://icimed.com>. and 50 % of visits to medical doctors!! - Various combinations of about 75 health problems or diseases. The results obtained with the RHUMART approach and systems, including the 50 % Reductions in prescribed drugs, and, in visits to medical doctors (40 % for generalists, and 60 % for medical specialists) are well summarised in two scientific reports by the CROP scientific survey team, based in Montreal. Author : René Tounissoux, Centre De Recherches Sur L'Opinion Publique, CROP Survey Supports RHUMART Claims, Improved Quality Of Life, Reasons For Buying The System, Reduced Pain, Report, Results, Results Of A CROP Scientific Survey, Scientific Survey, Sociology, Specific Results. Analysis, Author : René Tounissoux, Before / After, Comparison, Conclusions, Consumption Of Prescription And Nonprescription Drugs, Data, Drug Consumption, Frequency Of Medical Consultations, Impact Of RHUMART Auto-Santé System, Medical Consultations, Rhumart Clientele, Social Statistics. The 23 following NOTES are related to The 3 Pillars to save 35 % 0n health costs, the RHUMART approach and systems, the 27 video clips, and Rodrol's "Nobel Dream"
Preface 2 : Our Universe, from Only One Big-Bang? Videos (in alphabetical order using keywords) http://www.rhumart.com/library/vSearch& . and required a 10-month leave of absence from work. Driver’s licence, SAAQ, stable results after 20 years! By clicking on one of the three following icons (RHUMART journal cover pages), you will access a historical introduction outlining the nature of RHUMART self-therapy, and its scientific, clinical, and human bases. These journals also include some amazing results obtained since 1980. - Author’s Prefaceon Self-Medicine™ and the RHUMART Revolution. 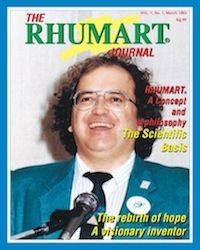 - Repairing the human body, rare diseases, and ... RHUMART miracles? - Reprogramming the body-brain-mind-spirit complex; repairing or creating new synapses; why do we need to sleep? The electrophysiology of the nervous system; introducing BAYES’ FORMULA to help select RHUMART parameters. and components of human beings? - Repairing DNA with signals generated by RHUMART Systems? and The F1-series of RHUMART systems. - RHUMART fertility centre, clinic or home? - The Universal RHUMART connection and the scientific philosophy of life; the perfect resonance of the “physical vacuum”; electric lightning in bio-membranes; cell nutrition, metabolism, and growth; simplified neuroscience; and means to control inflammation in some 80 % of chronic health problems. - RHUMART Advanced Neuroscience: historical intro and advanced education; including many beautiful photos, important drawings, and excerpts of unique PDF documents and pictures of Rodrol and RHUMART books; linking visible and invisible worlds; and Dr Drolet’s brief biography. NOTE : the book is available for download with iBooks on your Mac or iOS device.Multi-touch books can be read with iBooks on your Mac or iOS device. Books with interactive features may work best on an iOS device. iBooks on your Mac requires OS X 10.9 or later. The safety and Effectiveness of New Health Approaches? In order to help you answer this serious question, let us mention that the potential of genetic engineering to help control or resolve health problems and numerous diseases has largely been exaggerated, by many experts in recent years. On the other hand, the role of epigenetics related to environmental factors has been well documented recently. However, the basic research related to the potential of PEMF therapies, like the RHUMART approach and systems, as an "epigenetic therapy" has not really been undertaken. Nevertheless, considering the following actual results obtained by clinicians and owner-users of RHUMART systems since 1985, we recognise that the RHUMART approach has a well established potential to help patients afflicted by serious chronic health problems related to the five systems of the human body, namely : the Immune system and arthritis, blood Circulation, the Nervous system, the Locomotor system, and the digestive and endocrinesystems. Get a real sens of these RHUMART Truths, by watching the authentic testimonials below, these RHUMART Results were confirmed in High Courts of Law, in Canada, by honest and convinced doctors like Dr. J. Charlebois, MD, and Dr. A.-M. Bégué-Simon, MD. The RHUMART Tesla-Shumann Resonance Regenrator! With this original holistic approach, psychological, mental, and even spiritual aspects are taken into consideration to help people to improve their attitude towards their health and quality of life. Chapter 3 of the book"Self-Medicine™ and RHUMART Miracles"
- Human fertility: RHUMART twin girls (in Boston) and Bernard’s two miracles! - Just imagine the wide-ranging potential of the RHUMART health system? What it does, and how it does it. 10. One-page summary of RHUMART "Ultimate Anti-Inflammatory Therapy"
For the 354 page English version of this book,published in 1999, which includes an abstract of its contents, in 7 languages, click on the above underlined link. Electromagnetism and the Foundation of Life"
If you did not read Dr. Becker's book yet, you must treat yourself with this ground breaking and beautifully written book. It is a blessing for your heart and soul to read, and meditate on his extensive experiments, results, discussions and inspiring conclusions. His fundamental research career to understand the basic principles, and laws of natural bioelectricity, tissue repair and regeneration lasted over 30 years. He got a Nobel Price nomination,before he passed away, in 2008. Recently, Lloyd Burrell reviewed "The Body Electric ...". 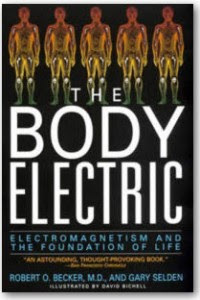 “The Body Electric: Electromagnetism And The Foundation Of Life” in 1985. Robert O. Becker was no mister average. He was a U.S. orthopaedic surgeon working mainly as professor at Upstate Medical Center in State University of New York, and as Director of Orthopaedic Surgery at the Veterans Administration Hospital. So just an M.D. But his passion was bio electricity. That’s to say the relationship between electrical currents and living things. He was trying to understand what causes limb regeneration. He did lots of research cutting off limbs from frogs and salamanders etc. which is well covered in the book. And eventually he developed a widely accepted technique for stimulating bone healing using electrical stimulation. He didn’t know it at the time but the electrical signals he was detecting in the bodies of both animals and humans, were part of the body’s energy system. In his later book, Cross Currents, he spoke of a “data-transmission and control system” located in cells, transmitting information by means of a DC electrical current. He was way ahead of his time on this. He was way ahead of his time on the EMF question too. He elaborated with surprising clarity the dangers of exposure to electromagnetic fields. And he was very lucid (not to mention bold) in blaming the public’s ignorance of the potential dangers of EMFs fairly and squarely at the foot of the door of the vested interests. What I admire most was his honesty. At that time, and even today still, science was dominated by a mechanistic understanding of the body. His view was “OK we may not understand it well, and it may not be a subject of study in mainstream medical research, but these healing processes are happening." Sadly Dr. Becker passed away in 2008 but not before getting a Nobel Prize nomination. This book goes a long way to bridging the gap between Eastern philosophies and modern science. It’s an entertaining read and a good way of gaining a better understanding of how your body works." - Chapter 15 : Maxwell's Silver Hammer (including ; "Subliminal STRESS". When I was 5, in 1950, on my father's farm in Quebec city, I became aware that "something in our body (or Mind)" can effectively block pain, if only we make the right decision in a fraction of one second (I thought then, in less than one tenth of a second). This personal awareness came from an accident, in which I almost lost the index finger of my right hand.Please, allow me to report this "wonderful" and unplanned experience of mine. Briefly, I decided to pull the one-inch diameter rough rope, to help my oldest brother pull this long rope (allowing him to pull back the huge fork, about 1 foot wide by 3 feet long, used to grab a large chunk of the hay load, parked in the barn). Just when I firmly placed my little hand on that rope, near the lower pulley fixed to the wall of the barn, the 2000-pound horse suddenly went forward, instead of backward, and I suddenly realised that my right index finger was stocked in this big pulley (near the barn). As I was already looking at my hand, when the horse started to pull forward, a terrifying image came to my Mind, in which my whole hand and wrist had completely been destroyed by that pulley (about the width of my hand). I instantly decided (within less than one tenth of one second?) to sacrifice my stocked finger and save my whole hand and wrist: this in an extremely fast backward-motion of my whole body, while I instinctively placed my left hand at risk in the pulley (in a quick reflex motion to make sure that my right index finger would break off and stay in the big pulley). And ... It did worked, as my "unconscious survival instinct" allowed me to save my right hand and wrist. I then experienced a surge of excitement, pleasure and joy (impossible to put in words) as I looked at my hand and wrist, and moved my wrist around to make sure that it was really there and properly functioning. It was an ecstatic moment ! And in the same second, I realised that I had absolutely no pain in and around my crushed finger. I had the feeling that it was no longer part of my body, just a strip of crushed meet, although it was still attached to my right hand ! Then, I thought "Why don't I feel any pain whatsoever in that hand?" and felt joy again, feeling nothing in that bleeding finger flesh. I save you from the details of what I did following that "wonderful accident". At 5 years young, I concluded that their must be something in our body, or in our Mind, that can completely block pain? Either when we have too much pain or when we are excited after a great survival decision? It was only about 30 years later that the endorphins, those natural morphine synthesised in our body, were discovered. But, in my young Mind, it was absolutely certain that we were equipped with some kind of natural pain control capacity, even if all the medical doctors I met when I was 5, 7 or 10 years old, denied this conclusion of mine. They simply answered that I felt no pain because the nerves of my finger were destroyed, but I replied "what about the tissues surrounding my injured fingers? Shouldn't they feel pain due to the open wound of that crushed finger? Then, they all kept silent, not really knowing what to say. So, between the age of 5 and 10, I decided that I was better counting on myself to find acceptable answers to such unanswered questions. At that young age, I had already decided to study science and medicine, not really knowing what would be the best for me? I personally suffered from these conditions for over five years. This is that tough period of my life that led me to the development of the RHUMART approach and systems. These tough health conditions began when I was developing the first working Urinary Bladder Stimulator or "pacemaker", during my M.A.Sc. project in biomedical engineering at the University of Toronto. Then, I succeeded in this optimisation project to develop the Bladder Pacemaker that was described in a scientific article, published in the British Journal of Urology, and later, in an article on the Bladder Control System in the journal of Medical and Biological Engineering. In this optimisation project, I realised that the optimal waveform and frequency for the electrical stimulation of muscles are closely related to the waveform of so called Action Potentials (APs) and to the frequency of these naturally occurring APs when these muscles contract. Universal Resonances and "The 7 Resonances of RHUMART Life Signals"
(for Pulsed Electro-Magnetic Field physiological stimulator) where the pulse waveform, amplitude, repetition rate, and modulationwould all be optimised to get the best possible physiological results. See also pp. 25-27 of the same Journal for a detailed discussion about this resonance. 2. The "Peak Density",J (in the range of 20 μA / square cm) of induced electrical current: Using a MAXI or a pair of MAXI-2A applicator(s) properly positioned, and connected to a MBI-3000 or MBI-3003 RHUMART Regenerator (with the Amplitude A ≈ 10). This "Peak Density" of induced current was measured in a very simple experiment reported at the bottom of page 55, and on 56 of said RHUMART Journal, No.1, it was found to be in the range of Ca++ current impulses, absolutely essential for the synaptic transmission of said "AP". Indeed, see p. 27 of the same Journal for the calculation of the "Peak Density" of electrical current impulses of Ca++ ions, which were found to be absolutely essential to allow the passage of nerve signals, AP, through the synapses of our nervous system: as calculated by myself, from a great scientific article by Dr. Llinás, M.D., Ph.D., in Sc.Am., Oct. 1982, pp. 56-58. Indeed, the RHUMART magnetic field, integrated and averaged over time, is easily shown to be in the exact range of the Earth's magnetic field (of its D.C. component). This is easily shown by any physicist or mathematician, using the exact waveform, pulse repetition rates, and modulation frequency of the RHUMART pulse trains. When we integrated and averaged these pulse trains, we obtained average D.C. fields between zero and a few Gauss, or 0.25 to about 4 Gauss, naturally depending on the RHUMART Applicator, Amplitude, and Modulation frequency of pulse trains used. the "patient" has too much inflammation in the treated region of the body. using the MBI-3000 or the MBI-3003 bioelectric regenerator. of a surprising experiment, which is briefly described below. In fact, we have shown that a group of 16 people can simultaneously be stimulated, showing active and visible muscle contractions, using something like the power of an electric rasor, using the optimised RHUMART type of bioelectric pulse trains. This experiment clearly indicates that the RHUMART type of bioelectric impulses, and impulse trains, are optimised in the most effective way, to produce muscles contractions in 16 people, with a ridiculously small amount of electrical energy. It seems likemost of themuscle contraction energy must come from the 16 people in the experiment ; and not only from this little MBI-1000RHUMART Bioelectric Regenerator? This is easily shown by connecting 4 groups of 4 people, holding hands side by side, the 1st and last person of each of the 4 groups, making a good contact with one of the two electrodes of each of the 4 channels. With this configuration of the 16 people, active and visible muscle contractions in the arms of the 16 peopleare observed. two components: the MBI-1004A and the MBI-1004B. (b) stimulation of ATP production with RHUMART bioelectric signals? For a detailed discussion about this, see the NOTE #20 below. of positive and negative signs on facing plates (or rings). - all spiritual guides, masters and groups aligned on the same philosophy. "Les Champs Magnétiques Pulsés, Votre Solution Santé !" 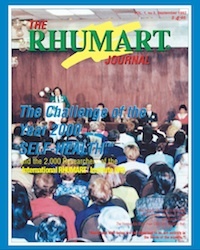 Quality of Life, using a RHUMART or a good PEMF health system. upon request of people or family in great need of a PEMF system. 17. Live to be 120, Repair DNA, and Replace organs? Or Stimulate Regeneration to Improve"The Body Electric"? In a recent article from National Geographic, An interesting article about man's dream of Eternal Life of our body, and the huge investments, presently made by a few billionaires (American, Russian, and Chinese) to revive the dreams of the antiquity, like that of the Sumerian King Gilgamesh. It's OK to spend a billion US dollars or more, on artificial organs, nanotechnologies, nanomedicine, artificial intelligence. Not to talk about functional robots to perform various tasks, like the Japanese have successfully developed. However, we think that it would be much less expensive, and risky, to invest in already proven methods related to bioelectricity and natural regeneration methods, with presently available wellness devices such as PEMF therapy systems. In particular, using the RHUMART approach and the various types of applicators developped and proven safe and effective for hundreds of acute or chronic conditions, diseases or health problems, as reported herein, and in two extensive websites: <http://www.RHUMART.com> . Pierre Lavoie Challenge, Karate kids, and "FORBES' Life Style"
How to invest in the Prevention of diseases and health problems? Like those caused by obesity, lack of exercises, and old age, for example. The Pierre Lavoie Challenge, in Quebec, Canada, is an inspiring example to make people move (walking, jogging, running, or riding bicycles). And to rise money for the Prevention, research, and treatment of various diseases. Instead of treating symptoms, we must work at the roots of health problems, do regular physical exercises, eat well, and have a satisfying social life to strengthen our immune system. USA : obesity and health problems, Big Pharma's or polititians' responsibility? Higher spending in health care doesn't necessary mean better health, Quality of Life and happiness. The American case is striking when we consider the money they spend and the poor results they often get for astronomical investment. In 2016, in the Ottawa region, a retired karate trainer who was diagnosed in 2007 to have Parkinson disease, and was degrading, like most cases, decided to graciously offer karate training to other old people afflicted with Parkinson. In October 2016, 9 years after his initial diagnosis, while all practically the patients diagnosed in 2007 were in worst condition, he and his "Parkinson's" karate trainees were improving their condition with regular classes with their gracious karate trainer. These life results draw the attention of the media (as reported by Radio-Canada TV, on evening news of October 16, 2016), and the generous "Old Karate Kid", will probably interest scientific and medical researchers to confirm the potential of his "Karate-Kid"approach. The inspiring results of these Old Karate Kids are not really surprising, considering the results obtained with the Pierre Lavoie Challenge and those published in FORBES'article, cited above. And, as you should be convinced by now, people of all ages could improve their Mobility and Quality of Life by taking regular sessions of RHUMART physical conditioning, in the confort of their home, in some kind of RHUMART Health Club, Health Centre, or "21st-Century Medical Clinic". The RHUMART approach is most important for people suffering from chronic inflammatory diseases, as reported herein. 19. Titles & Links to the 27 Clips of the "Rodrol ABC series"
- what could be named "Scientific Buddhism"
Preface 2: Our Universe from the Big-Bang? And, for a demonstration of Active Muscle Contractions (in 16 adults, simultaneously), using Optimised bioelectric Pulse Trains, generated by the miniature MBI-1000 RHUMART system (with MBI-1004 A & B, Super-TENS units), you can see the two DVDs, iRi-1 and iRi 1 to 5, available on request from Rodrol University. Intro 1: Wisdom at 5 and The AS9 Connexion? Intro 3: Wisdom at 5, 11, or 72 ? Back to the Son-Sun, and ... the N.Y. World Trade Center? 20. Introduction to Cell Nutrition, Metabolism, and Growth, Indirect Stimulation of ATP Production with RHUMART optimised bioelectric signals. Macromolecules are assembledfrom their respective subunits: proteins from amino acids, nucleic acids from nucleotides, polysaccharides from simple sugars, and lipids from glycerol or other alcohols, fatty acids, and (in phospholipids) special subunits such as choline. In every case, the condensation of subunits to form a macromolecule requires that the subunit be activated – i.e., coupled by means of a suitable energy-rich bond to a substituent group such as phosphate (P), pyrophosphate (PP), adenosine monophosphate (AMP), or coenzyme A (CoA). The energy of the activating group’s linkage then provides the energy needed for condensation, and the activating group is split off in the process. In general, the ultimate source of activating groups is adenosine triphosphate (ATP). In nucleic acids and in proteins, it is template-directed: DNA serves as the template for its own synthesis (complementary branches of the unrolled DNA-spiral are formed and these branches unite to form the new DNA molecule). DNA also serves for the synthesis of the various types of RNA; messenger RNA serves as the template for the synthesis of proteins. In carbohydrates and lipids, on the other hand, the arrangement of subunits is entirely determined by enzyme specificity. Given these systems for the orderly and directed condensation of subunits, the principal functions of metabolism are seen to require three factors: (1) - to generate the subunits themselves from intermediate metabolism. (2) - To generate ATP from adenosine diphosphate (ADP) and inorganic phosphate and (3) - to generate reducing power (as NADP.H2) for those instances in which the substrates taken from the medium are more oxidised than the overall products of biosynthesis. The subunits of macromolecules are fatty acids, monosaccharides, amino acids, purines, and pyrimidines. All of these may be furnished by the medium. Many microorganisms can synthesise the required subunits from suitable sources of carbon (e.g., glucose), nitrogen (e.g., ammonia) and sulfur (e.g., sulfate). HOWEVER, all biosynthetic pathways are under NEGATIVE END PRODUCT REGULATION, including both repression of enzyme synthesis and inhibition of enzyme action, so that subunits are not synthesised if they are available in the medium. The availability of subunits is greatly increased by the action of specific transport systems in cell membranes that can produce internal concentrations of subunits 100- or 1000-fold over the external concentration (in the case of microbial cell membranes, for example). In the case of microbial cells, when a subunit is not available, the cells synthesise it as mentioned above. There are two general mechanisms for generating ATP by nonphotosynthetic organisms: substrate phosphorylation and oxidative phosphorylation. In both cases, bond energy from a metabolic intermediate is used to create a molecule of ATP from ADP and inorganic phosphate (Pi). Substrate phosphorylation: this term is used to describe the two steps in the so called “Embden-Meyerhov” pathway through which an energy-rich phosphate bond is created. For details, see the 14th edition (Lange Medical Publications) of the book: Review of Medical Microbiology by E. Jawetz, Ph.D., MD, J.L. Melnick, Ph.D, and A.E. Adelberg, Ph.D.
Electron transport phosphorylation: in respiration, pairs of electrons are transported from an ultimate electron donor (such as NADH) to an ultimate electron acceptor (such as O2). This respiration process involves an electron transport chain in which electrons are passed sequentially from one electron carrier to another of increasing oxidation-reduction potential. This electron transport system is very similar to the ping-pong ball electron carrier described earlier in this chapter. A typical chain might be as shown on page 63 of the above-mentioned Review of Medical Microbiology (where the arrows denote the passages of electrons and the numbers in parentheses are the approximate oxidation-reduction potentials in volts (or electron-Volts, eV, since we are talking about the electrical potential associated with electrons). And, for (Cytochrome a --> O2), Δ (eV) ≈ 7 x 0.07 eV !To me, this observation is extremely important in relation to the basic electricity presented in the above mentioned book, "Self-Medicine™ and RHUMART Miracles". Especially when we think of Millikan's experiment, when he first measured the electrical charge of a single electron, in 1905. In his experiment, Millikan used very small oil droplets floating between the 2 plates of a parallel-plate capacitor, he realised that the charge carried by one droplet (driven by a 2000 DC voltage applied many times successively in both directions, and noting the time for the droplet to go back and forth) was always a multiple of the electron charge, 1.602 x 10 (to the power -19) Coulomb. Here, we realise that the energy transported by the five successive carriers is always a multiple of 0.07 eV. That is precisely the energy gained by an electron when accelerated across a transmembrane potential of 70 mV, or 0.07 Volt: precisely 0.07 eV! We conclude that the production of ATP by means of Electron Transport Phosphorylation is in quasi-perfect resonance with the cell membrane lightning processes discussed at length in our book "Self-Medicine™ and RHUMART Miracles". This means that indirect stimulation of ATP production with RHUMART® bioelectric signals is achieved through facilitating the transmission of AP (Action Potentials) across synaptic junctions of the nervous system (see NOTE #12 for details). As for cell nutrition, growth and division, as we discussed in the same book, the unidirectionality of many cell transport mechanisms causes cell to intake essential nutriments and sub-units of macromolecules and to eliminate waste products of metabolism, to grow, and eventually, cause cells to divide and multiply. Indeed, a simple explanation of cell division could be that the newly duplicated DNA macromolecule has the same overall electrical charge (either positive or negative) as its mother DNA cell, causing the two helical DNA macromolecules (when rolled in a kind of “chromosome ball), to repel each other, forcing the mother cell to elongate and, eventually, to divide into two well-equipped cells. 21. A Brief Message to Dr. William Pawluk, M.D. "Self-Medicine™ and RHUMART Miracles : the Rebirth of Electro-medicine"
Dr. Pawluk, I ask you this, for the benefit of all American citizens and doctors, because I really think you underestimated them in your response to my letter just mentioned. Nevertheless, I wish to congratulate you for the indefatigable energy that you already invested for the diffusion of many kinds of PEMF devices. Let us recall the highlights or main topics related to the 3 Pillars discussed herein. over the present degenerative conditions of the health and happiness of billions of people. - Chinese's - Hippocrates's - RHUMART's - ICIM's - Pierre Lavoie's & François Drolet's. And try to see how these approaches complement each other for the best of humanity. the immune system, and help control over 80% of health problems. Spontaneous Remissions and Cross Currents? Dr.Roland A Drolet (Rodrol), Ph.D., (from U. of Toronto,1971)...? Professor Georges Hall who was my supervisor or "employer" for my summer job, told me, after I demonstrated him the "real possibility" of Eternal Motion, without any visible power supply, that he could see, he was so enthusiastic that he stayed silent for a moment, and said "Maybe, we are on a path to a Noble Prize"! I had carefully hidden the little High Voltage power supply that maintain an electrically charged "Ping-Pong ball Pendulum"oscillating without decaying, between the two plates of a //-plates capacitor. So, I told Dr. Hull that the time was not quite ripe for us to submit our results! ... And then, I told him ... about my ... Secret Power Supply! About 25 years later, around 1990, when an adult man who suffered terrible life conditions and was "seriously" considering suicide. This was before he discovered the RHUMART system and approach, that allowed him to regain a good Quality of Life, and live happily. Later in the same year, in front of an audience of about 1400 people, at a public RHUMART conference, held in the Quebec City Hilton Hotel, he affirmed that he would have killed himself if the RHUMART solution was not there for him. Which book is presented in NOTE-11 above. This was the second time that somebody thought I should be awarded a Nobel Prize. Wow! Wow! I was really happy of such a recognition by a grateful user of RHUMART Therapy. But, I was so busy in 1990, and I felt I had better things to do than spending time to consider a nomination for a Nobel Prize. I thought, I should think about such a nomination, if only it could help the People of the Worldrealise the full potential of the RHUMART Approach and systems. Hence, contributing to the Health, Quality of Life and Happiness of a large fraction of the suffering humanity. This was 27 years ago ! In 2017, considering the present pledge for a healthier and happier World, I strongly believe that the time is ripe for a huge step. That is, to diffuse the enormous potential of the RHUMART Approach and systems. These systems have been available since 1980. First in Canada, now in about 22 countries on the 5 Continents. But, in 2017, RHUMART systems are not used to their full potential. Also, they are not used by enough people to make an important shift of awareness for the benefits of humanity and Life on Earth. any safe and effective wellness method or system. The RHUMART Approach and System. In one sentence, what is the RHUMART system? As experienced by real people. The University of Toronto, Laval University? or one in agreement with the goals mentioned herein? the Rules of the Swedish Noble Organisation. (in Short Track Speed Skating, Nagano, 1998). And M. Jean-François Bohémier, P. Eng., (Québec City). directly to me, and kept them strictly confidential. Hoping to read you soon. RHUMART Self-health without borders is an alternative form of medicine that is pain-killing, anti-inflammatory, and regenerative. Here is an outline by Dr. Jean Charlebois, M.D., a brilliant general practitioner who, after 25 years practicing medicine in Quebec, seven years using the RHUMART system in his clinic, and two years with the Bioelectric-Medicine™ team, understands and eloquently expresses the potential of this new and revolutionary form of alternative medicine. To meet Dr. J. Charlebois, MD, and listen to his brief outline, please click on the following link : (in French, click on the image) Video T19, t5 (click on Text for the English version). 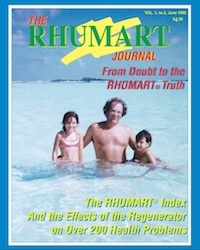 It is also important to mention that, contrary to contemporary medical approaches in America, Europe, and elsewhere, RHUMART’s holistic approach gives a sense of active involvement, control, and responsibility to the owner-user of this Self-Health™ bioelectric system, as evidenced in this convincing discourse (presently in French only) by Dr. A.M. Bégué-Simon, M.D. (born in France and an “expert in medical and paramedical disciplines” for the Paris Court of Appeal (Cour d'Appel de Paris) : to listen to her original discourse (in French), click on the link : Video 6N, t3. This approach actively involves the owner-users of the RHUMART system by “teaching them how to select the configuration and the parameters of cellular conditioning”. For a detailed tachnical document on this unique RHUMART approach and system, you may download the complete US Patent, No: 5 620 463, simply by clicking on its following title: “Electrophysiological Conditioning System and Method”. This method of bioelectric self-therapy brings about essential physiological effects and promotes better communication between all basic ''components" of the person, including the physical body and brain, the mind and the spirit. This multidisciplinary approach is based on more than 30 years of experience (since 1978) and results obtained by thousands of people who suffered from numerous health problems including more than a hundred chronic illnesses. Hundreds of illnesses, which we have arbitrarily classified under some twenty conventional ''medical specialties", can be challenge with the RHUMART’s holistic approach. Using the RHUMART approach, patients are directly involved in improving their health and quality of life. This, after a short training period to learn the proper methods for using the Self-Health™ RHUMART system. Then they are ready to take care of themselves with this holistic view of their human condition! Arthritis and over 50 other health problems! Conferences by Dr. R. A. Drolet, Ph.D.
Interactive-Health™ conferences: Dr. R. A. Drolet, Ph.D.
© All rights reserved, Dr Roland A. Drolet, Ph.D. and the International RHUMART Institute (iRi), Quebec, Montreal, Toronto, Edmonton and Vancouver 1980-2011. ® RHUMART, Bioelectric-Médicine and other expressions followed by (™) are trademarks of Free World Trust (FWT) and the (iRi).